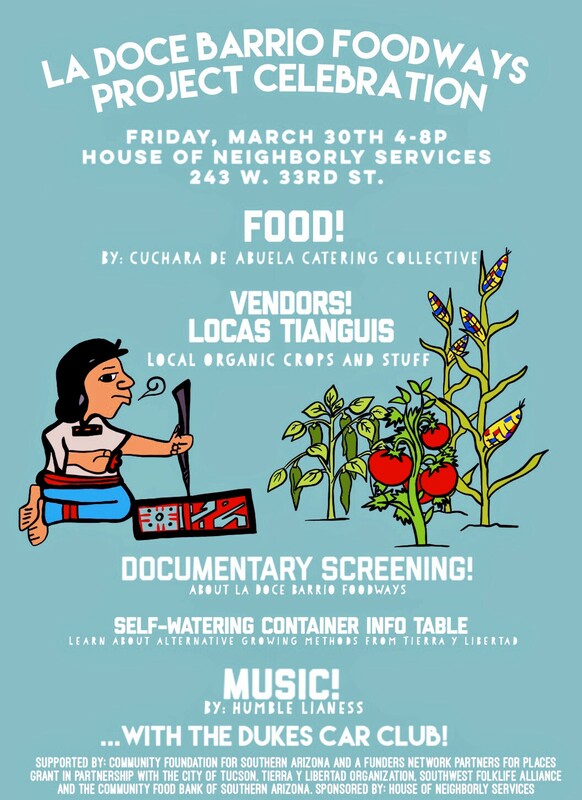 The public is invited to honor the food traditions along “La Doce” (as locals calls the stretch of 12th Avenue from the I-10 Freeway to Drexel Avenue) on Friday, March 30 with a celebration, including the screening of a mini-documentary, a self-watering container workshop by Tierra Y Libertad Organization, a local tianguis (market), and the release of a bilingual report. The celebration honors the work of La Doce residents who participated in La Doce Barrio Foodways Project, which aimed to look beyond the commercial landscape to identify opportunities for food resiliency and creativity among residents. The project engaged over 200 La Doce residents and visitors in researching how food and foodways contribute to community identity and resilience. Research consisted of training a cohort of local “citizen ethnographers,” primarily youth from Pueblo High School and several adult mentors, to map green spaces and informal food practices in 40 residential blocks, administer questionnaires, and conduct in-depth interviews with 25 La Doce residents. Through inventories of fruit trees, backyard gardens, food memories, and the skills of home cooks, the project collected data that will be used to craft possible alternative food economies for the area, from farmer’s markets to artisanal food small businesses and micro-enterprises.